"Great experience here - the interior design is amazing and t..."
Have a question for Seven Terraces? "Great attention to detail and fantastic service." "Staffs are very friendly and we enjoy a lot!" "A very beautiful heritage hotel and with a central location." 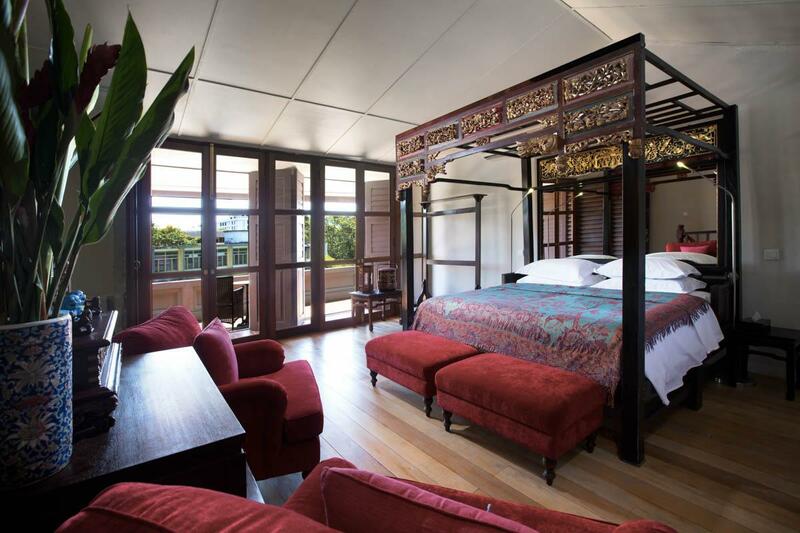 Renovated in 2012, the Seven Terraces guarantees guests a pleasant stay whether in Penang for business or pleasure. The hotel is not too far from the city center: just 1 km away, and it normally takes about 40 minutes to reach the airport. Also within easy reach are Penang Chinese Town Hall, Consulate General of the Netherlands, Kuan Yin Teng Temple. Seven Terraces also offers many facilities to enrich your stay in Penang. While lodging at this wonderful property, guests can enjoy free Wi-Fi in all rooms, 24-hour security, daily housekeeping, gift/souvenir shop, taxi service. In addition, all guestrooms feature a variety of comforts. Many rooms even provide television LCD/plasma screen, additional bathroom, additional toilet, clothes rack, complimentary instant coffee to please the most discerning guest. The complete list of recreational facilities is available at the hotel, including outdoor pool. Superb facilities and an excellent location make the Seven Terraces the perfect base from which to enjoy your stay in Penang. "This is a beautiful place to stay right in the heart of Pena..."
The breakfast provided is non-halal. 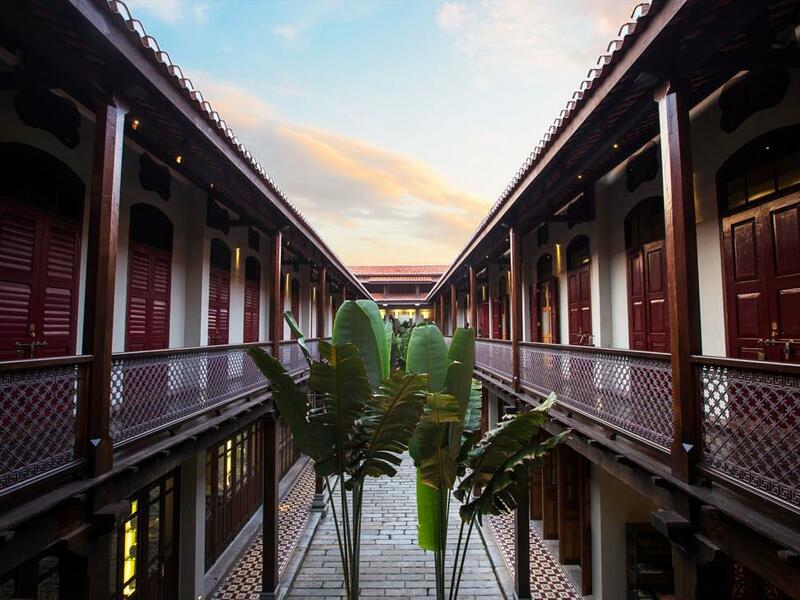 The hotel is converted from 7 old shops built in Southern China architectural style. We lived in a duplex room well designed and decorated in old styles. If you like heritage buildings, this is an ideal choice for you. The hotel also has a very nice restaurants serving fusion food. right in the city centre of Penang!! We were able to walk everywhere and the staff was super friendly. The main entrance is a bit hidden and actually on a side street but we were able to just enter through the restaurant. The attention to detail and sensitivity in the restoration of this block of houses into a single hotel unit is truly remarkable. The overall ambience and the split level balcony rooms truly conjure up the feeling of what a Peranakan home would have been like at the turn of the C20th. Management team of Wendy and Robert very friendly, informative and knowledgeable. No in house a la carte menu which is a bit frustrating, but obviously the area around Chulia St is teaming with great local food - the Won Tee Noodles and Char Siu restaurants recommended were fabulous. A wonderful establishment and certainly one I would recommend for the experience for those with an interest in the culture, heritage and history of Penang. The property is amazing and lovingly maintained. The location is right in heart of old Georgetown. The staff are very friendly and professional. This is one of the best small hotels I've stayed in and the best hotel I've stayed in Malaysia outside the big 5 star international chains in KL. There was a mix up with my booking which was handled with grace and generosity. The staff in general are very friendly and attentive. The breakfast was amazing. The property is lovingly maintained and finished and very very clean. I can see why this hotel reviews so well and I didn't get the feeling the hotel will rest on their reputation alone. Highly recommended. The room gave you a luxurious feel when you stepped into it. The hotel was equally great. Convenient carpark, and great location to explore the heritage area surrounding the hotel. And the famous Kebaya restaurant which I hope to try it out next time. Overall, highly recommended! Seven Terraces much much beyond our expectation, it really value for money. We stayed at Stewart Suite, it was very spacious. The living room equipped with TV, sofa & even an opium bed located upstairs of the room while bedroom & bathroom located at downstairs. The bathroom was too big equipped with an awesome ceiling height shower. They also provided complimentary tea & local"kuih" when we chilling out at the poolside during tea time. The breakfast was so delicious and you can order as much as you can if your stomach is big. The friendly staff made our stay so memorable and definitely we will be back. The first thing I notice is the friendliness of the staffs. They were genuinely friendly and always ready to serve. We took the apartment which was obviously huge for us and our 2 young ones. They love the swimming pool, surprisingly. Location is good and surrounded by the best of the local cuisines in Georgetown. Breakfast was awesome and prepared fresh. Not buffet style. All in all, highly recommended for anyone looking for unique boutique style of hotel! This is a private boutique hotel with only 14 maisonette rooms if i am not wrong. The design was amazing,and was a fusion between modern style and traditional peranakan style. The British style breakfast included in the package tastes good. The staff are nice and help full. I departed from Penang in a public holidays when my car rental company is closed on the day. I just left the key to the hotel reception and they are trustable and kind enough to help me return the key to the staff of car rental. We are in awe with the design on this hotel. Very unique. Located in the heritage zone. Staff are friendly and attentive but it would be even better to have a staff who can converse in Mandarin. Room is very spacious and comfortable. Will definitely return to this hotel again. My wife and I stayed there this past weekend and Seven Terraces impressed us from the very get go. We were particularly impressed with the attentiveness of the staff (especially Faizal and Massi - hope I got their names right) and they were very accommodating with regard to our check out timing as my wife needed somewhere to stay while I was at work. The missus was particularly impressed with the design of the bathroom and said it was the best rainshower she ever had. Seven Terraces is also right in the heart of Georgetown and the main historical/cultural pathways (where they have Penang's now famous street art)are well within reach. Plenty of good food and not to mention cafes around, so you'll be spoilt for choice. Staff, the hotel itself, and the staff again! Seven Terraces is a really, really, lovely place to stay in, just like the pictures shown! 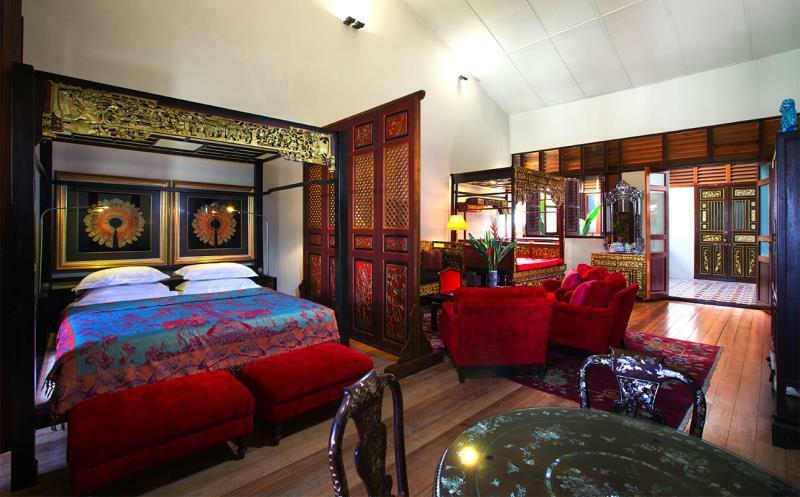 The hotel room is decked out in straits Chinese / Peranakan glory without compromising on comfort. I love the design of this hotel, from the double-decked room, to the very spacious toilet/shower area cleverly set in the balcony! I have to commend on the really lovely staff in this hotel. They are very friendly and ever so ready to dispense tips on good eating areas, questions about the hotel's designs, etc! We felt right at home with the fabulous staff! Unfortunately I didn't quite get to capture their names.. The hotel very good design and decoration, all staff are friendly and helpfully when require. The hotel is very closed to the local restaurant easy to walk and very quiet in the night time , we are feel safety when stay here feel like a stayed in the house not hotel. We will be back to stay at seven terrace again when we visit Penang. Great experience here - the interior design is amazing and the rooms are beautiful and luxurious. Restaurant and service quite nice although for food, Penang has more on offer. Location is so-so but seemed reasonably safe to access at all times of day. Georgetown can be a bit confusing to walk around anyway, but with a map it's no issue. Lovely atmospheric hotel. We had three rooms. Need to be aware that rooms are either bed downstairs and living area on mezzanine or vice versa. Bed upstairs was much better as great to have lovely open ground floor as your living space. These exquisitely restored terraces offer suites that are furnished and decorated with beautiful antiques as well as some extraordinary contemporary sculpture. They are close to many of the highlights of George Town and to several of the delightful pieces of street art that characterise the vibrancy of this town. Best of all, the staff offer warm hospitality that treats every guest as an honoured individual. This is a beautiful place to stay right in the heart of Penang. It has been lovingly and tastefully restored and exudes elegance and charm. The staff cannot do enough for you and when in the hotel you feel as though you are in an oasis of calm, perfect for escaping the busy streets of the town. The location is perfect as you are within walking distance of lots of attractions and delicious restaurants. You must make sure to eat in the hotel restaurant at least once during your stay as the food is really really good.